4Videosoft iPhone 4 to Computer Transfer is an ultimate iPhone 4 to Computer software to transfer iPhone 4 songs and movies, photo, ringtone to computer easily and completely without any loss for you to backup. Moreover, this tool supports all iPhone 4/iPod models, including the latest iPhone 4 OS 3.0/3.1, iPad, iPhone 4, iPod Firmware 3.0/3/1, iTunes 10.1, iOS 4.3/4.3.1, iPad 2, iPod touch 4 and iPod Nano 6 now. 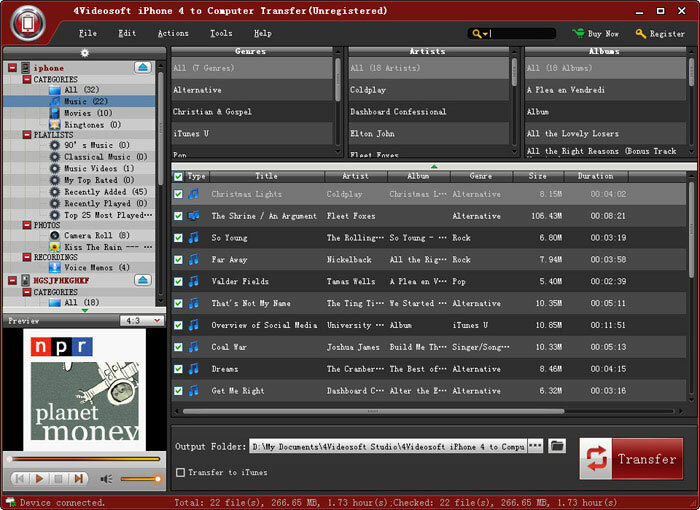 ...... Once connect your iPod/iPhone 4 devices to this transfer software, it will show you the detail information immediately. Then use the quick search function to find your wanted files exactly by the category of genre, artist and album. Just click the transfer button to finish the backup. Make it available to transfer or backup iPhone 4/iPod songs, music, videos, photo, ringtone to Computer without losing anything making use of 4Videosoft iPhone 4 to Computer Transfer. Quickly detect the files you want to transfer by the search function as the category of genre, artist and album. This iPhone 4 to Computer Transfer can be used for iPhone, iPhone 3GS, iPad, iPad 2, iPhone 4, iOS 4.3, iPhone OS 3.0 and all the iPod models. Qweas is providing links to 4Videosoft iPhone 4 to Computer Transfer 4.0.20 as a courtesy, and makes no representations regarding 4Videosoft iPhone 4 to Computer Transfer or any other applications or any information related thereto. Any questions, complaints or claims regarding this application 4Videosoft iPhone 4 to Computer Transfer 4.0.20 must be directed to the appropriate software vendor. You may click the publisher link of 4Videosoft iPhone 4 to Computer Transfer on the top of this page to get more details about the vendor.